Jeffrey Miranda ’18 turned toward his father, mother, and older sister, sitting in the row behind him at the Lafayette Posse graduation ceremony, and tried to hold back the tears. He spoke to them in Spanish. It poured from him in a voice made viscous with emotion. Neither parent received much education past third grade. Years ago, they moved to the U.S. from their home in El Salvador in search of a better life for their children. Now, here it was. Miranda thanked them for their love and support. Like most of his classmates in DC Posse 9, he is a member of the first generation of his family to cross a stage and accept a diploma. “I’m excited to keep the adventure going for you guys,” he told them. Unlike the larger commencement ceremony at Fisher Stadium, the annual Posse gathering, which took place during the rainy hours just after dawn, was a small affair. Nineteen students and their families filled plates with catered breakfast foods and gathered in the Wilson Room of Pfenning Alumni Center. Everyone had a chance to speak during the open mic, the portion of the ceremony where graduates and family members often tearfully attempt to add a punctuation mark to their four-year ride. “You’re going to be great!” hollered a woman in the back. “You’ve all matured so well,” said another woman. Next to her, the graduate’s sister buried her face into a tissue. 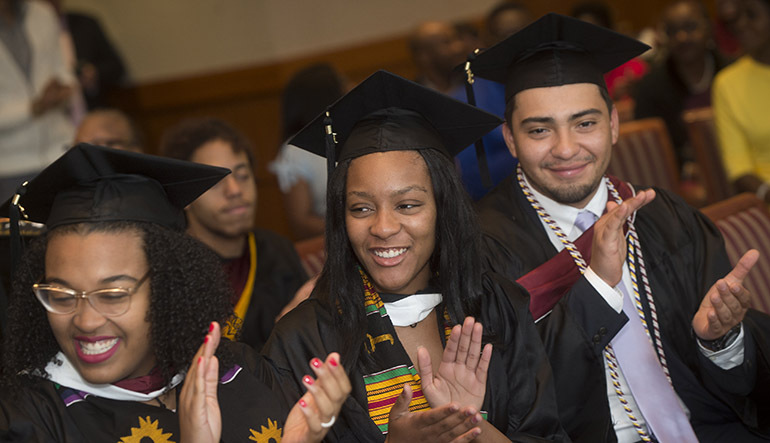 The Posse Foundation encourages multicultural leadership at colleges throughout the country by recruiting diverse Posses of 10 to 12 public high school students. Each Posse is trained and encouraged to enroll at top-tier colleges. 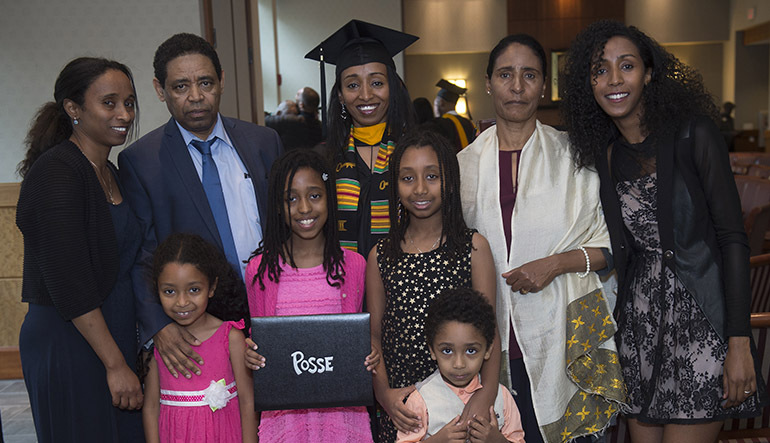 Many Posse scholars are the first from their families to attend college. Lafayette partners each year with Posses in New York and Washington, D.C.
“I believe in Posse because of what they provide,” says Lawrence Malinconico, associate professor of geology and environmental geoscience and director of Technology Clinic. 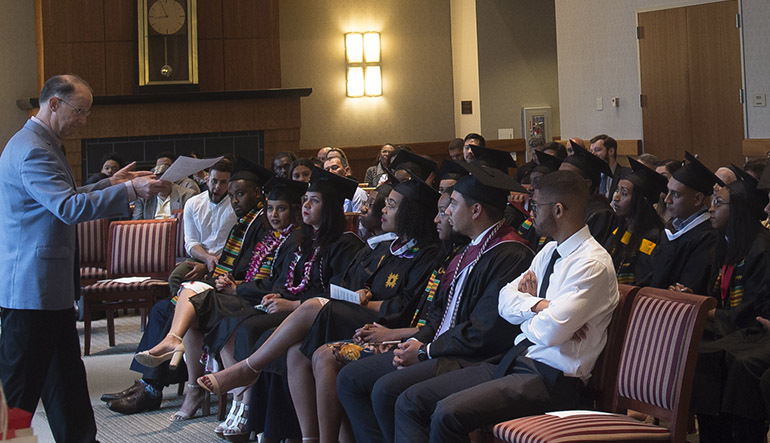 Malinconico served as the faculty mentor for the group from the nation’s capital, DC Posse 9—the ninth Posse from Washington to graduate from Lafayette. “It’s an honor to have been on the journey with them,” says Ian Smith, Richard and Joan Sell Professor of the Humanities and mentor of New York Posse 13. Mentors meet their Posse groups before classes begin at Lafayette. Malinconico, for example, met DC Posse 9 at a team-building camp in West Virginia. Over four years, both mentors and students meet privately and in group meetings. Posse classmates support and encourage one another. Some groups cling to one another more than others, Malinconico says. DC Posse 9’s members didn’t always lean on one another, but they pulled together when the need arose. Natasha Harris ’18, a member of the New York class, thanked Smith for his leadership. “Thank you for talking me through meltdown after meltdown after meltdown,” she says. Ryan Cope ’18 agreed. “There were times when I felt like I wouldn’t figure things out and when I felt lonely,” he says. “He was there. He never rushed me.” Meetings scheduled to last minutes often extended into hours. “All four years. That’s the type of Posse mentor and the type of father he is,” Cope says. “It’s bittersweet,” Malinconico says. His speech included a story for each student. He’ll miss the meetings and interactions. These graduates are headed for auspicious careers. Miranda landed work with Deloitte Consulting. Ashley Rodriguez will soon start at Memorial Sloan Kettering. Teresita Galarce Crain will intern with CNN over the summer. Malinconico will keep tabs on Facebook and trade emails. Rodriguez’s parents, Jose and Wanda, say their daughter, who has always been brilliant and helped tutor college students while she was still a junior high school kid, now has friends from around the globe and horizons that grow ever wider.